Wearables processors today are few and far between, with most Android Wear OEMs, for example, relying on Qualcomm for its Snapdragon 410 processors. The Snapdragon 410 is a common wearables processor, but the problem with Snapdragon processors is that, up until Qualcomm unveiled the Snapdragon Wear 2100 and the Snapdragon Wear 1100 for children and the elderly, there was no processor developed specifically for wearables. Samsung has relied on Snapdragon processors for some of its wearables in the past, but the company is looking more and more to produce its own components in-house. Along this mindset comes Samsung's new 14-nanometer wearables processor called the Exynos 7 Dual 7270. The Korean giant took to its own blog to make the announcement earlier this week. The Exynos 7 Dual 7270, so named because it's a dual-core processor (hence the "dual"), will be the first in the world to be manufactured on a 14-nanometer FinFET process instead of the typical 28-nanometer process on which most wearable SoCs are made. Current high-end smartphones such as the Galaxy S7 and Galaxy S7 edge are run on 14-nanometer technology, and Samsung is now looking to bring this to wearables so that your wrist experience is as premium-performing as the phone in your pocket. The Exynos 7 Dual 7270 looks to bring 20% more power efficiency to battery life in wearables through the use of its two Cortex-A53 cores. Additionally, Samsung has now integrated its own Category 4 LTE 2CA modem that will allow even smart fitness bands such as the Gear Fit3 (if there's such a device in the works) to run on cellular connectivity and operate in the same standalone fashion as the Gear S (3G) and Gear S2 3G smartwatches. WiFi and Bluetooth are the typical connection sources, and these are on board as well. 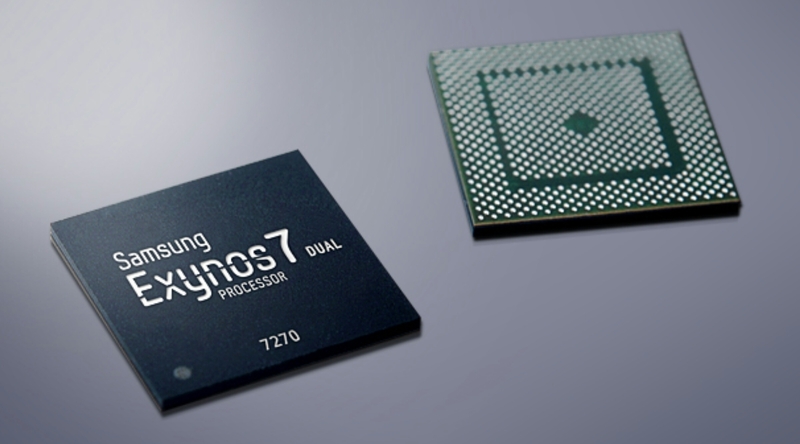 Last but not least, Samsung intends to produce the Exynos 7 Dual 7270 with its SiP-ePoP technology. What this means is that the "system-in-package" (think of an SoC for smartphones) through use of its new embedded package-on-package (ePOP) method -- a strategy that allows Samsung to place more sensors and technology into its wearables while keeping wearables thin and light. All of this delicious tech means that your wrist wearables will stay thin and light (they may even get thinner and lighter) while packing more sensors that can measure elevation, blood pressure, muscle mass, along with other health tracking and doing so with a much improved battery efficiency and power-saving measure than ever before. Samsung's Gear S3 Frontier and Gear S3 Classic are said to be heavier than last year's Gear S2, so perhaps this new processor will best work for fitness bands in the future, at least.